1 The Lord appeared to Abraham by the oaks of Mamre, as he sat at the entrance of his tent in the heat of the day. 2 He looked up and saw three men standing near him. When he saw them, he ran from the tent entrance to meet them, and bowed down to the ground. 3 He said, ‘My lord, if I find favour with you, do not pass by your servant. 4 Let a little water be brought, and wash your feet, and rest yourselves under the tree. 5 Let me bring a little bread, that you may refresh yourselves, and after that you may pass on – since you have come to your servant.’ So they said, ‘Do as you have said.’ 6 And Abraham hastened into the tent to Sarah, and said, ‘Make ready quickly three measures of choice flour, knead it, and make cakes.’ 7 Abraham ran to the herd, and took a calf, tender and good, and gave it to the servant, who hastened to prepare it. 8 Then he took curds and milk and the calf that he had prepared, and set it before them; and he stood by them under the tree while they ate. The three figures form a sort of mystic circle and they seem to say to us: ‘May you all be one as we are one.’ (cf John 17: 21). The communion of the Holy Trinity is lived out in prayer, above all in the Eucharist. 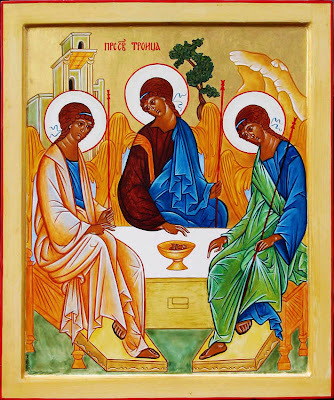 This icon speaks of the Eucharist and the Church as if the mystery of Christ in the broken bread is immersed in the ineffable unity of the three divine Persons, with the Church itself an icon of the Trinity. (Revd Canon Professor) Patrick Comerford is Lecturer in Anglicanism, Liturgy and Church History, the Church of Ireland Theological Institute. This Bible study was part of a lecture/seminar on 8 October 2016 as part of the MTh module TH 8824: Liturgy, Worship and Spirituality with part-time MTh students, Years III-IV.